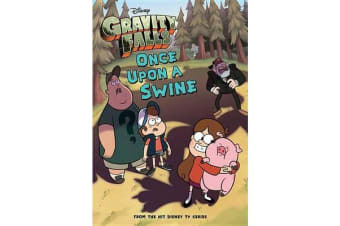 At the moment when Mabel wins Waddles the pig at the Mystery Fair, Dipper ruins his chance to impress Wendy. But when Dipper finds a way to travel back in time and changes his fate with Wendy, Mabel’s fate also changes-for the worse. Will Dipper and Mabel tweak time so they both leave the fair a winner? Will Mabel ever share a slice of pizza with her beloved Waddles again? Then, when a prehistoric creature snatches up Waddles, it’s up to the Gravity Falls gang to save him! Readers will love this 112-page chapter book filled with black-and-white art from the show.